FACT has instituted an annual Shivaji FACT award of Courage, given to person(s) / Institutions who have embodied Shivaji’s virtues of courage, fearlessness, devotion to Mother India, respect for all. The first one will be awarded by HH Sri Sri Ravi Shankar on the 12th of March in Mumbai when he opens the Shivaji conference/exhibition. Shivaji, was endowed with talents of the highest order and a clear vision, the only one who stood-up to the injustice. He had also an inspiring and endearing personality which spontaneously commanded respect, loyalty and the highest sacrifices from his devoted soldiery and peasants. 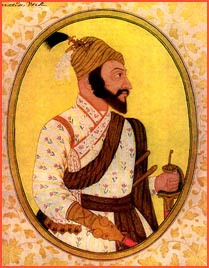 Shivaji is relevant today because embodied all the qualities that politicians should possess, but do not always have: he was just, firm and stood for the weak; he was an honest and able administrator; he confronted the enemy and was not cowed into submission; he was devoted to Mother India, who appeared to him as Bhavani; he was ruthless with his enemies, but spared women, children and his own people; he had respect for all religions.